Here in dreamy Zatka, one can relax in the gardens with splendid views or by the pool side, yet only 10 minutes away from everything a modern way of life has to offer. NONO consists of four detached houses and the swimming pool area on the grounds of 3500 m2. The ancient stone walls in the ground floor of each house ensure cool summer and warm winter. Each house has its private outdoors area thus providing complete privacy. are located on a terraced grounds and are interconnected with the outdoors stairs leading to the swimming pool area (1 pool; 8x4x1.5m and 2.pool; 4.60×1.20m) and private meadows, to the public footpath and access to the village road. 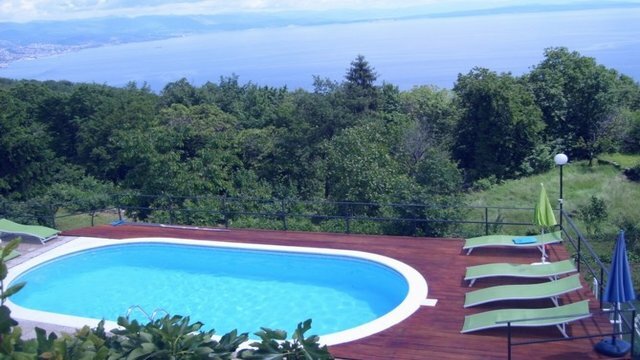 They are placed in a quite, sunny, south facing area and each house has a beautiful view of the Kvarner Bay and picturesque landscapes of Učka massif. an ideal refuge for one in search of rest in a simple but beautiful rural setting and as such it provides the temporary escape from the ever faster pace of contemporary life in the urban environment.